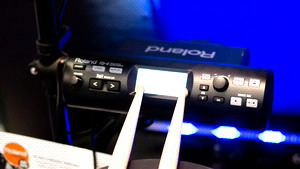 KitMonsters – Roland TD-4KP V-Drums. The music makers’ guide to making music. 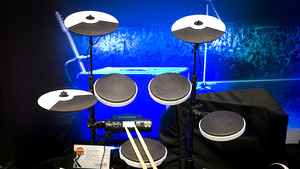 The TD-4KP V-Drums are designed for flexibility and portability - they fold up quickly and can be carried in a bag. 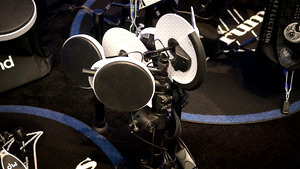 The TD-4 sound module is the brain and has 125 instruments and 25 pre-configured kits. You can edit the sounds and there’s an onboard Rhythm Coach for practising. The cymbals are adjustable and chokeable and the idea is that you can can use the kit for backstage warm-up, for rehearsals, or gigs where space is limited. There are eight pads - kick, snare, toms x3, hi-hat, crash and ride cymbals and there’s an FD-8 Hi-Hat Controller included. The snare and tom pads feature cushioned-rubber surfaces designed to be quiet to use with a natural playing feel, and you can get extras such as mesh-head snare pads, to customise the kit.